Yes, let's send each Search Engine's spider a personal invitation to visit your site. Note! 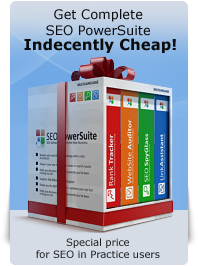 Search Engines don't expect you to submit all your webpages (just think of some forums that have a few thousand pages — the owner would go crazy submitting them!). All you have to do is submit your homepage. Want an example? Here we go with Google! To add a page via your Webmaster Tools account, see detailed instructions at http://support.google.com/webmasters/bin/answer.py?hl=en&answer=1352276. 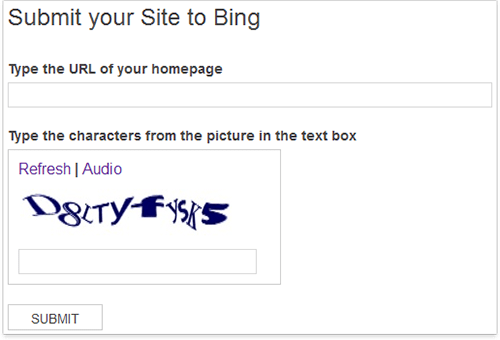 If you choose to proceed with the second option, after you land on the page http://www.google.com/submityourcontent/website-owner/, choose "Add your URL", enter a URL you want to be indexed, type in CAPTCHA and submit the request. Easy, isn't it? 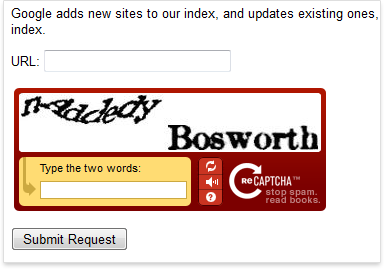 Here you have to enter your website's URL alongside CAPTCHA. Click Submit — and that's it. Submit your site to all Search Engines that you think are important, and the crawler will come to your site to look at it. If there's a special local Search Engine in your country, like Yandex in Russia, or Seznam in Czech Republic, it's also important to submit your website there. It won't take much of your time to submit to Search Engines, but it may take quite a long time till the crawler visits your site. In my practice, it took up to 6 weeks. And, it also depends on the Search Engine. Quite logically: if the Google spider loves some web page and visits it quite often, and that page has a link to your site, then this Google crawler will be happy to follow the link and look at your site, too. Same thing about other Search Engines. So here's what I'm driving at: try to get a link from some respected web page with a good Page Rank (preferably 4 and above). DO IT NOW! Submit your website to Search Engines, or put a good link to your site, or better do both. Moreover, even if the site:your_domain_name query brings correct results, the problem may still exist, therefore going through what I say next is a must! And, what I talk about further makes a big plus to know, even if your site is found by Search Engines. So look through the points below anyway, and do all I recommend. Even if you think your site is totally OK, I'm sure you'll find things to improve. Previous: Do Search Engines know about you, and do they know enough? I must confess, I read every bit of this post and am satisfied with what I read.Thanks. How often the search engines crawl the sites? But the frequency crawl will be closely linked on the frequency of adding new content. So the data (frequency crawl) in the sitemap do not play a big role. I must of missed something, as a new user, can you explain how to add a FATLINK. Adding a FAT link means getting a link from the respectful,frequently updated and visited page. Such pages are frequently crawled by Search Engines' robots and as a result, the sites linked to such pages are also frequently re-crawled. Our site on Alexa has gone from 18 million + to 2.7 million but it still doesn't show up in any keywords rankings ,I don't know if i can attriubute this to just improveing our site by fix up some decriptions , titles, on posts and photos etc . Or this just google doing some internet wide changes . What are your thoughts abotu Alexa ranking. Alexa rank is the index based on how frequently your site is visited. Sure it is an important SEO factor that should be taken to account, but please note that it is no way related to Google and the way it treats sites. Please remember.The fact that you improved your Alexa rank doesn't mean that your site position in Google will rise. Rasheede i agree with you. At the Moment Google is the Major Search engine who cover round about 85% searches made in the World which is a huge difference. Yes this is good step although bing and Yahoo need more work to be done on their search engine so that it will improve their search results. you are really a lectural,and the book you wrote is quite explanatry.But when after i click submit your site for free it redirect my system to Bing.com,instead to yahoo page submit your URL for free. Yahoo now uses Bing search engine to return its results, so you only need to submit your site to Bing for your site to be crawled and show up in Yahoo listings.